I have FALLen so hard for fall. And we are only a day and like six hours in. I am telling you, I am jumping in with both feet, get ready. So this is the balance salad. You see, I figured that after those apple pecan pie cronuts on Friday I should maybe throw in a little green and skip the cheese. Oh wait, there’s still cheese in this, but I just couldn’t help myself. Life is boring without cheese. Oh and I feel I should mention that it is snowing right now. Only only the mountain tops, but geez guys it’s still snow. This means it is cold and rainy and the ultimate cozy weather. Now do you see how I can jump into fall so easily? It’s just not my fault. I have no control over the crazy mountain weather, but I have to say it happens every year. And well I sometimes complain about it, I secretly love it. There is just nothing better than cozy weather. Since I cannot just fill your minds (and stomachs) with pure cheese, pasta, pumpkin, cookies, cake, brownies and butter all the time I decided to go with salad. Ok and the boys were gone for three nights last week. This meant it was the perfect opportunity to actually not have to cook two meals and just cook one green, non meat meal. It was an awesome three days. So where did the boys go? Those punks got to go on a little mini vacay, mid school week, and fly off to LA for a quick Burton (yeah that’s my brother Red in the red Hoodie and the last of the 3 boarders hiking up the hill) photo shoot. They lived it up like rock stars in some Hollywood hills home, came home and had to face a reality check – sorry boys, that life doesn’t exist here. No maids (yeah they really had maids), no five-star restaurant burgers for lunch, no swimming in infinity pools at eleven o’clock on a Thursday, and today – yep, back to school (for the few hours they go). Obviously, they are having a hard time adjusting. Their lives are so rough, huh? Anyway, when the boys are away apparently I make salad. But whatever, I was happy. This salad has honestly all of my favorite foods. 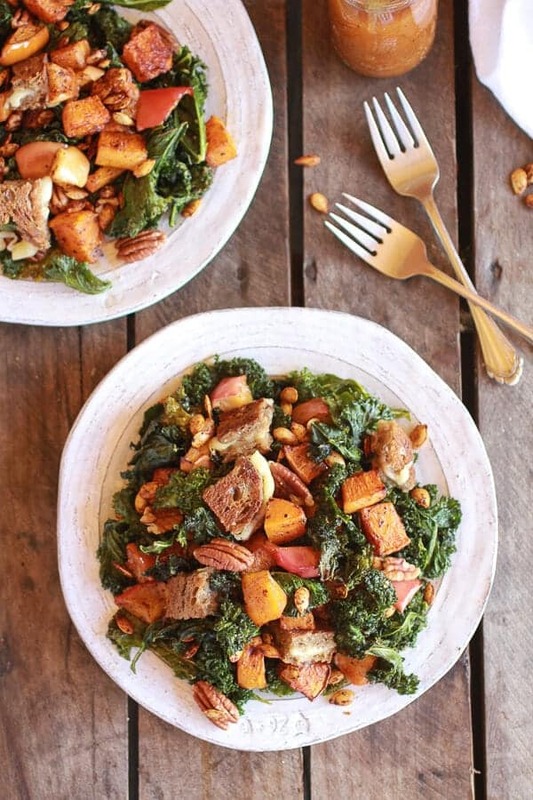 Butternut squash (all time favorite fall veggie), apples, crispy kale, pecans and even stinkin grilled cheese croutons. Oh and it’s all warm and cozy. Personally, those are my favorite salads. There is nothing remotely hard about putting this salad together, but it just takes some hands on time. Peel the squash, clean the seeds, roast the veggies, make the dressing, make the grilled cheese, roll over from how amazing that ooey goey brie looks, and then toss it all together. Like I said, not too hard, just a little work. But it is SO healthy and SO good. And I mean brie grilled cheese croutons? This salad has honestly all of my favorite foods. 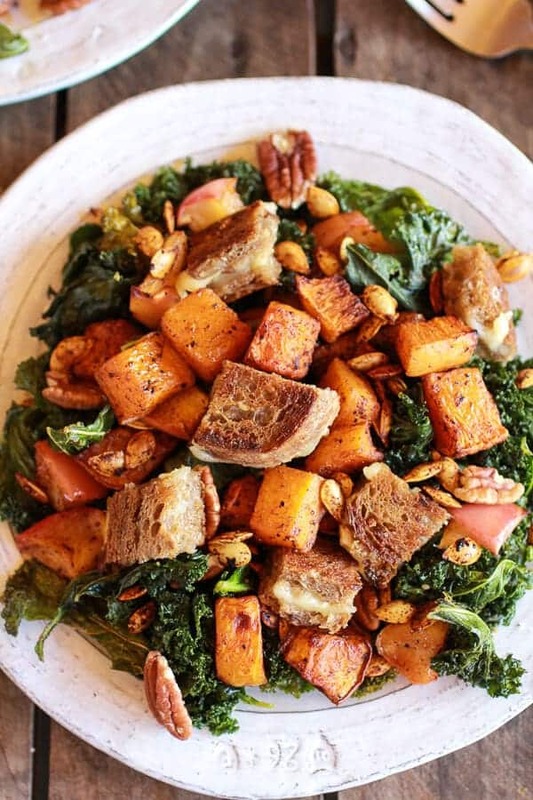 Butternut squash (all time favorite fall veggie), apples, crispy kale, pecans and even stinkin grilled cheese croutons. While you work on the dressing preheat the oven to 400 degrees F. and start the kale. Add the kale to a large bowl. Add 2 tablespoons olive oil, 2 tablespoons parmesan cheese and a pinch of salt and pepper. Toss well and massage the kale with your hands for a good 1 to 2 minutes. Spread on a baking sheet and bake for 15-18 minutes, tossing 1-2 times while cooking, until crispy. Remove and place in a large bowl, set aside. While the kale gets crispy start working on the squash. In a small bowl combine the chili powder, cinnamon, cayenne, brown sugar, salt and pepper. Mix to combine. Peel and chop the squash, but reserve the seeds and add to bowl of water. Using your hands separate the seeds form the orange goopy flesh. Place the seeds in a paper towel and pat dry. Set the seeds aside. Add the squash to a sheet pan and drizzle on a tablespoon or so of olive oil. Sprinkle with about half the spice mixture and toss well. Bake for 20 minutes, remove from the oven and add the chopped apples and pecans and add a sprinkle more of the seasoning and then toss it all together. Bake for another 15-25 minutes, or until the squash and apples are tender. 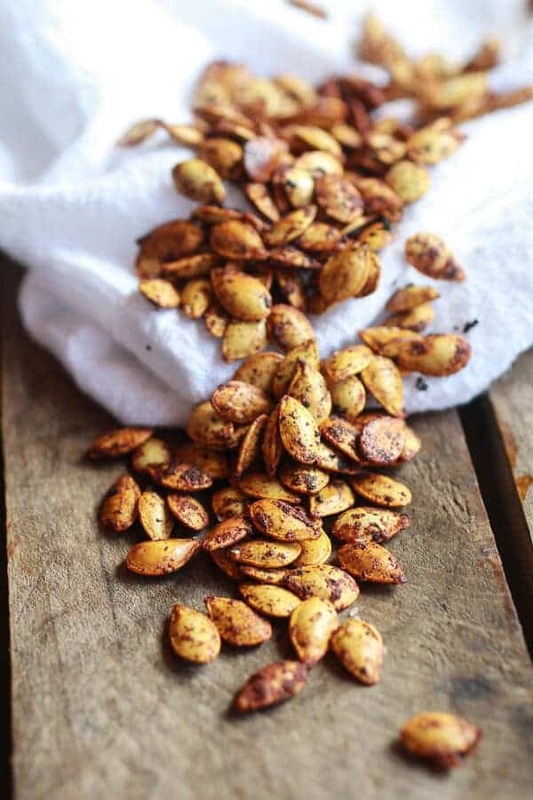 Now grab the seeds and place them in a small baking dish. Add 2 teaspoons olive oil and the remaining seasoning. 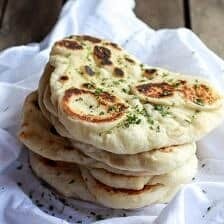 Toss well and bake for about 10 minutes or until lightly golden and toasted, but watch carefully, they will burn quickly. Set aside. 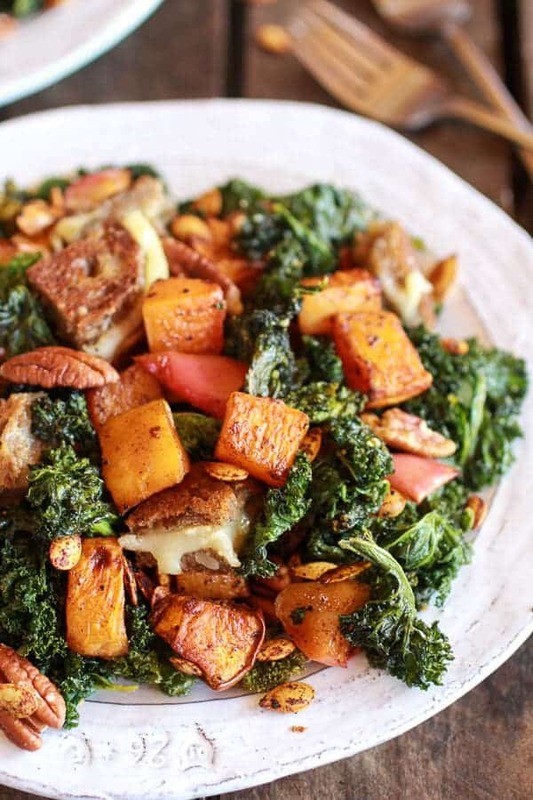 Now add the roasted, butternut squash, apples and pecans to the crispy kale. Toss. Heat a medium skillet on medium heat, add a tablespoon butter. Sandwich the the brie between 2 slices of bread. 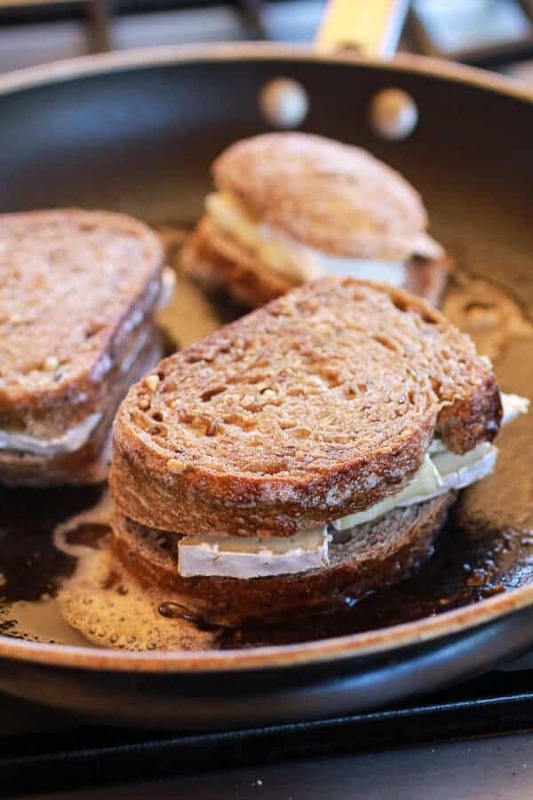 Add the sandwiches to the skillet and cook for 3 to 5 minutes on both sides or until the bread is toasted and the brie is melted. Remove and let sit a couple minutes and then chop into cubes. Divide the salad among plates and top with the croutons, roasted seeds and a drizzle of the apple cider dressing. EAT! Best addition to a salad. Ever. This sounds out of this world delicious!! This salad does give me the warm and cozy feel. Looks great! Uhm…. brie baked croutons? I can’t even breath, this looks so good. Definitely going to be making this for lunch one day this week. Where’d the inspiration for this dish come from???? Grilled cheese croutons – brilliantt. Thanks Ali!! The idea for the croutons came from this soup of mine! 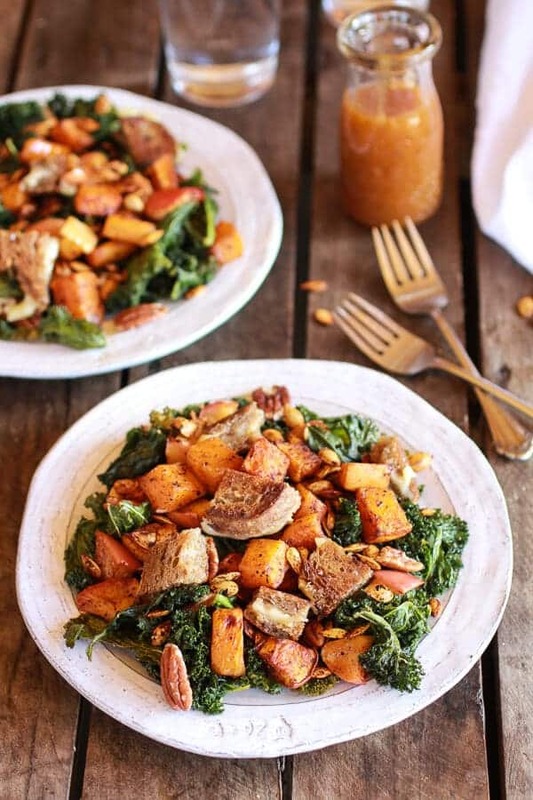 Mmmmm,love the combination of kale and butternut squash! 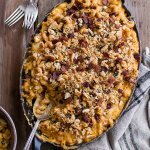 This looks like a hearty fall recipe to add to my list. 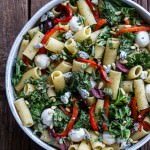 This is seriously such a gorgeous salad, T! And definitely one I could get on board with eating everyday. Thanks Ashley!! 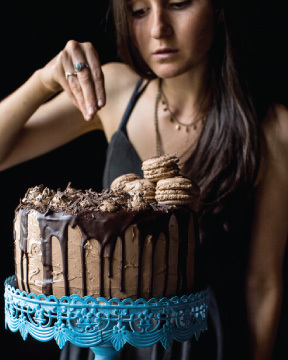 I am stilling drooling over all your pumpkin recipes. Girl, you have been killing me the last week. Amazing! Amazing looking salad, here! Ironically, not even 30 minutes ago, (at 07:30 in the morning,) I was having a discussion with some colleagues about the versatility and nutritional value of kale. What a great combination you have given us! Thanks Dan! Gotta love kale! Thanks Ali! The croutons are the best part! Nice salad! 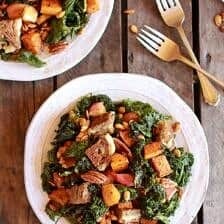 It is always nice to add grilled cheese croutons to salads! This salad shot me dead, sis…shot me dead. 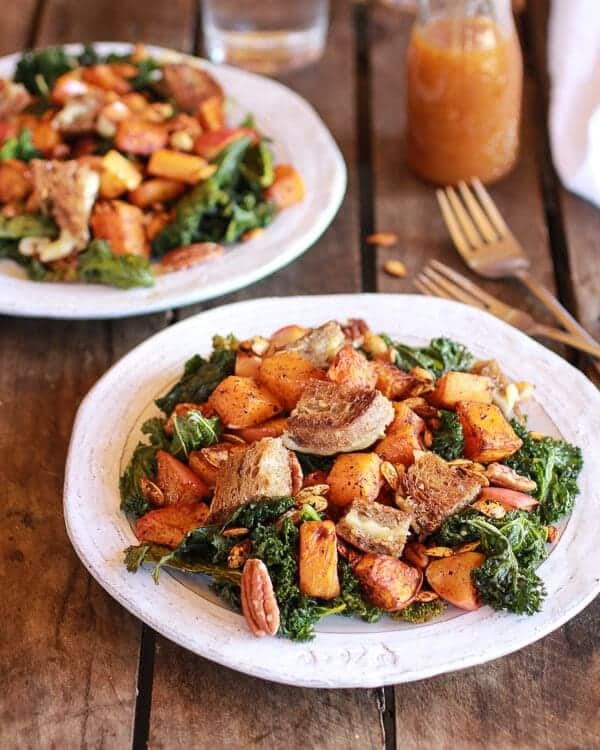 I’m a big fan of fall too and a warm fall salad with kale butternut squash, and apples is right up my alley. Now if only I could rope you into making it for me eee’ery single day….. 😉 Hope you had a lovely weekened! Hehe 🙂 I would gladly make these for you any day!! 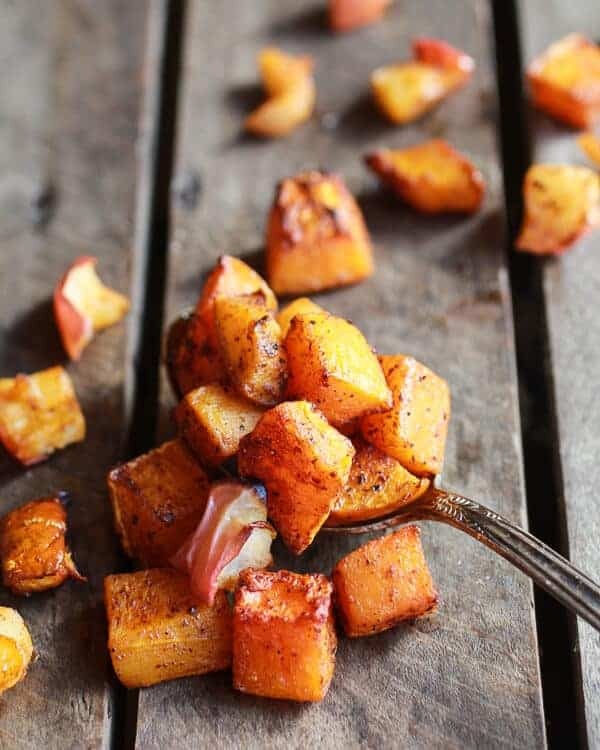 This mouth-watering dish just screams FALL!!! I’m so excited about these brie grilled cheese croutons I can’t stand it!!! Yum!!! BRIE GRILLED CHEESE CROUTONS?? And kale? Those are like my favorite things ever! Love this salad! 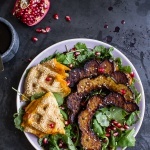 Such a gorgeous fall salad, and those brie grilled cheese croutons look to die for! This may take a little bit of time, but those brie croutons alone make it worthwhile! Thanks for a great recipe. I heart fall too! And this salad. Swoon. Those croutons look amazing! What a great idea, I can’t wait to try it! So lovely, and I love the brie croutons. OMG…. Gorgeous! I jumped into fall Labor Day weekend. A little early but I COULD NOT WAIT. And now that it’s in full swing I don’t even know what to do with myself. I do know one thing though, I should definitely eat this salad. And 543,291 of those croutons. Haha! I was right there with you! Thanks Des! Great flavor combinations and I’m dying over the grilled cheese croutons!! Thanks so much, Gaby!! The croutons are my favorite! This salad looks wonderful! And love, love the photos. So warm and cozy. Thank you so much, Laura!! It’s funny because i really hated these photos, but then again, I never like my photos! What a cool trip for your brothers! 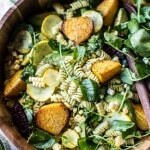 This salad is beyond amazing and the croutons……love the croutons!! Thanks Julie!! The croutons are the best! Thanks Stacey!! You are so kind to share!! I saw this salad when you posted it to instagram and twitter and just had to come back and say how totally delicious it looks. I love everything about it. Totally my kinda salad and totally gonna make it! Awe, thank you so much! Hope you love this, Grace! Let me know! 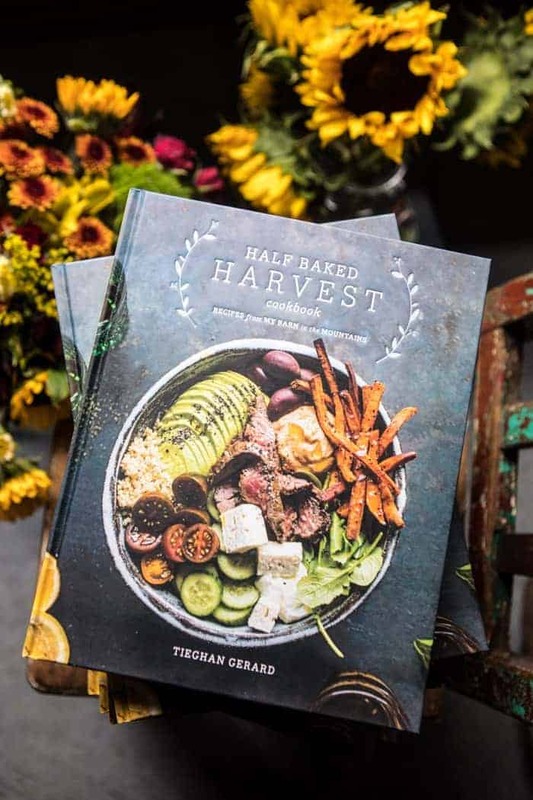 What a beautiful fall salad Tieghan! I love the roasted winter squash – I’ve been getting lots of winter squash in my CSA Box and am looking forward to roasting it for salads. Looks delicious! I secretly crave rainy cozy days, fall is my favorite! I especially like the apple cider dressing, I think the kids are going to love it. Thanks Sherri! I hope everyone loves this! 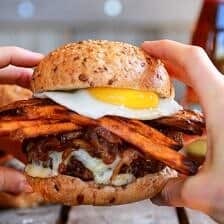 I had this for dinner and it was absolutely amazing! Super filling and nutritious and delicious. 😀 Thanks, Tieghan. I know I’m late to the game on this salad, but WOW. Are brie and grilled cheese croutons even legal? Brilliant. 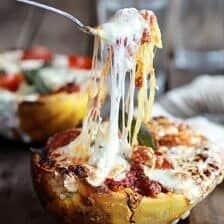 I just made this tonight for dinner, and it was absolutely amazing! I omitted the croutons and added sautéed andouille sausage (Browned until crispy-brown), then topped it off with crumbled goat cheese. It was 5 star restaurant quality! 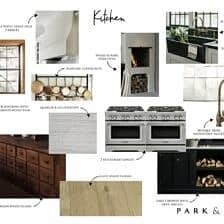 Tieghan, this looks wonderful. Thank you for posting this! Do you think I can roast the squash and seeds and make the dressing tonight, but do the kale and pack everything separately for a short drive tomorrow morning? I can assemble just before eating. I think that will work great. Hope you love this and happy thanksgiving! Looks amazing!! How well does this save? Thank you! It makes great leftovers for at least a few days. I skipped the croutons because I was to lazy to go buy brie but gosh, this salad was it fit for the gods. It took me 1.5 hours to make but it was worth every second. Thank you so much! So happy you loved this Genevieve! Thank you! !